Egg hunts and bunnies make for a happy Easter for all. 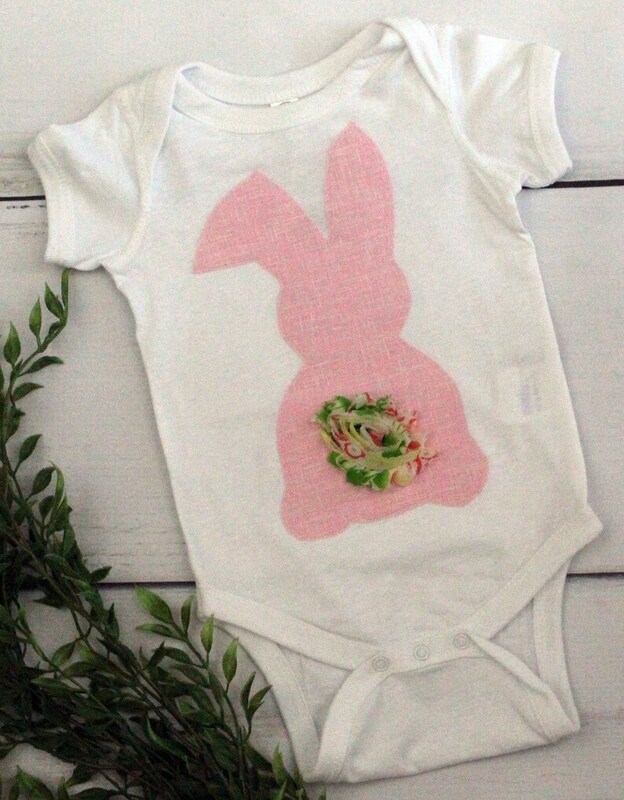 Made with high quality Rabbit Skins brand 100% cotton body suite is U.S. infant sizes 6 months, it will fit and feel wonderful. Infant size fit short sleeved white lap sleeve creeper. Cloth bunny done in raw edge applique with shabby flower "tail" featured on the front. It's prefect for the neighborhood egg hunt. Each of our bunny shirts are unique, not two have the same fabric/tail combination. This is a completely one of a kind shirt. Please note this shirt is a "raw edge" applique, as it is washed the edges will fray into a soft shabby chic look. *We welcome wholesale/bulk orders. Please send us a message for details. ** Please visit www.etsy.com/shop/livilouandco for these and other great handmade items. *** Like us on Facebook to keep up with new listings and get the scoop on sales. Machine wash on the gentle cycle in cold water. Hang to dry. Cool iron as needed. Very cute. No issue with shipping. The seller was accommodating. So cute, and the recipient got coloring right away! We welcome custom orders. All custom orders must be paid in full before work will begin on the order. Illinois residents must pay sales tax which will be calculated at check out. We hope that you will love your product. However, if you do have an issue with your order please contact us to discuss it and arrange for an exchange or refund. Refunds will not be given in the event an order did not make it in time because of shipping, please allow plenty of time for your order to arrive. Ready to ship items will ship within 3 business days of receiving payment in full. Orders are shipped 1st class mail via USPS with delivery confirmation unless other wise noted. Once an order is shipped we can not control the carrier, you may add insurance, signature confirmation, or expedited shipping at additional expense. You should always allow plenty of time for your order to arrive before you need it, generally 5-7 days for 1st class domestic shipping, up to a month for international orders. We are not responsible for customs charges on international orders. We love custom, wholesale, and consignment orders. For custom orders please note our current turn around is 2 weeks from the date the order is paid in full. Work will not begin on custom orders until payment is made. For wholesale orders please message us for details on price breaks and quantity minimums. Do want to feature our product in your consignment store? Please send a message to us with the details we would love to talk. We hope you will love the item you purchase, we strive to provide high quality products that our customers will enjoy. In the event that there is a problem with your product please contact us so we can work to correct the situation.